Big Eggo will always hold a special place in Beano lore as the comic's original cover star. However, it has to be admitted that the character was not terribly inspired - arguably even less so than Thomsons' other cover stars, Korky the Cat and Koko the Pup. Although the strip was drawn competently by Reg Carter, Eggo himself was never an attractive figure. An ostrich is not an easy thing to make loveable, and Carter fails spectacularly, giving Eggo nasty, scaley legs and feet, a scabby bald head and rather bizarre Mickey Mouse-style hands on the end of his wings. The Mickey Mouse theme continues with Eggo's unpleasantly realistic crescent-moon eyes - a terrible idea for a cartoon character and one that Disney himself abandoned fairly quickly. 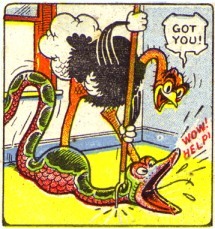 Overall, then, "Big Eggo the Ostrich" was pretty ropey. How it managed to stay on the cover for ten years is anyone's guess. When Dudley Watkins' Biffo the Bear took over the cover - a blessed relief! -Eggo was relegated to a black-and-white quarter-page strip inside the comic, which ran for a year or so. He remained on the comic's masthead (i.e. to the left of the Beano logo) until around 1954 when he was replaced by Dennis the Menace. That was truly the end of him - hooray! As far as I know his only subsequent appearance was in issue 2000 (1980) when the cover of the first issue was reprinted, to the mystification of a new generation. STOP PRESS! Big Eggo has recently made a suprise guest appearance, in a strip entitled "Lord Snooty's Day Out" and drawn by Ken H Harrison (issue 3093 - October 27th 2001). Eggo is revealed to be living in the Beano Retirement Home, along with Jonah, Lord Snooty and Jack Flash. Mad.